Cleveland County is located on the South Carolina border, west of Charlotte. The county seat is Shelby, known for providing many of North Carolina’s 20th century governors in a “Shelby dynasty”. The city of Kings Mountain is also located within the county, and was the site of a famous Revolutionary War battle. It has one of the highest shares of blacks of any western North Carolina county. U.S. Senator Kay Hagan was born in the city of Shelby. Forecast: Politically and demographically, Cleveland County has been stable. Historically, the county had a strong Democratic party atypical for its western location, and Democrats still maintain a strong lead in voter registration (47% Democrat and 31% Republican). But the days of Democrats carrying the county are no more. 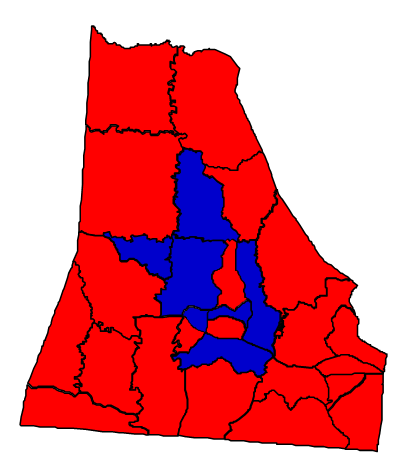 In the 2008 Senate race, Kay Hagan won a strong victory statewide but failed to carry the county of her birth. The county is very inelastic. Pretty much all the working-class white voters who can be persuaded to vote Republican already do so, but because of the high black population, Republicans have difficulty exceeding 60% of the vote here. With the white vote solidly in their corner, Republicans have a secure hold on Cleveland County. Romney won here with nearly 60% of the vote, McCrory won by well over 60%, Cleveland elects Republicans to the legislature and Republicans also have control of the County Commission. The Democrats, despite a strong base of support, are guaranteed permanent minority status in Cleveland County for the near future. A candidacy by Hillary Clinton in 2016 would likely yield vast improvements with white voters, but it is unlikely that even she could carry the county. The growth rate is very weak – only 1.86% between 2000 and 2010. But the racial composition is almost unchanged, with the exception of growth in the Hispanic population, which is still far too small to provide any hope for Democrats.